I love when I can get a Monday post ready in advance. It means I can enjoy my weekend without thinking too much about writing a blog post. Not that I don’t love to write blog posts but, well, sometimes it feels like work. All of this is to say that, while you won’t get to hear about my weekend today, you will get to see a mosaic of the photos I took in March. Another photo diary of my life. Cocktails and food. A mini getaway. Knitting and birds and Easter. I love the way flowers crept into so many photos this month. Ones in the garden, ones in my home and so much yellow. Spring must be here, right? Could someone please tell Mother Nature? Yesterday was pretty…today is just stupid. 🙂 Love the photos Carole! 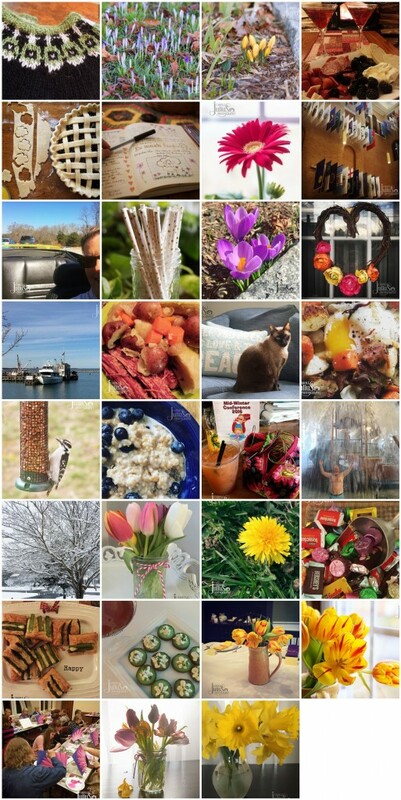 another great month – I love all the pops of color! sorry April is off to a snowy start…hope Spring comes back soon! Ignoring the snow and focusing on the shift toward spring yellow at the bottom of your mosaic! I feel you on the winter weather. The good news is that the snow goes away much quicker than it does in January! Only the March mosaic can have photos of both snow and dandelions. Yay, Mother Nature! Great photos as usual Carole! That little woodpecker is just adorable! And, I love your stopover!! Your posts appear to come easily and you always have the perfect picture. Love the many bright and happy thumbnails you’re sharing. Sorry for the snow. It is spring after all, but I hope you get some sun and warmth soon! FLOWERS!! Yay! Spring is taking her sweet time here, as well; there are way too many days in the forecast with snowflake images. Yuck.